I have a real dislike of pushy selling tactics. My personal policy is to never buy from people who phone me, knock on my door, or stop me in the street. Of course, I’m aware of the conflicts this creates for me as a communicator. When I develop communication materials, I often try to grab the attention of disinterested audiences. Yet here am I, openly expressing frustration about organisations trying to use the same tactics on me. The sticker came with a message from the company, saying that they’ve received letters and calls from clients complaining about doorknocking salespeople. Their note says that they recognise that people get frustrated by door-do-door salespeople, so they’re providing information about how consumers can get on the ‘do not call’ telephone register and providing a sticker for people’s doors to stop salespeople from knocking. It struck me as interesting that their solution to people complaining about their salespeople was not to stop the sales tactic, but to shift the blame to all salespeople and provide residents with a sticker. 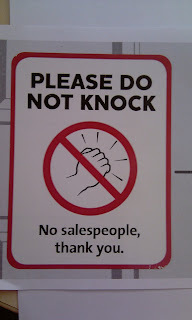 They’ll still undertake door-to-door selling themselves, but they won’t knock at your door if you display the sticker. They’d win more credibility in my eyes if they decided to stop door-to-door selling completely. The sticker itself is interesting. What are the chances that delivery drivers or other visitors will see the ‘do not knock’ message, and interpret it like a ‘do not disturb’ hotel message? 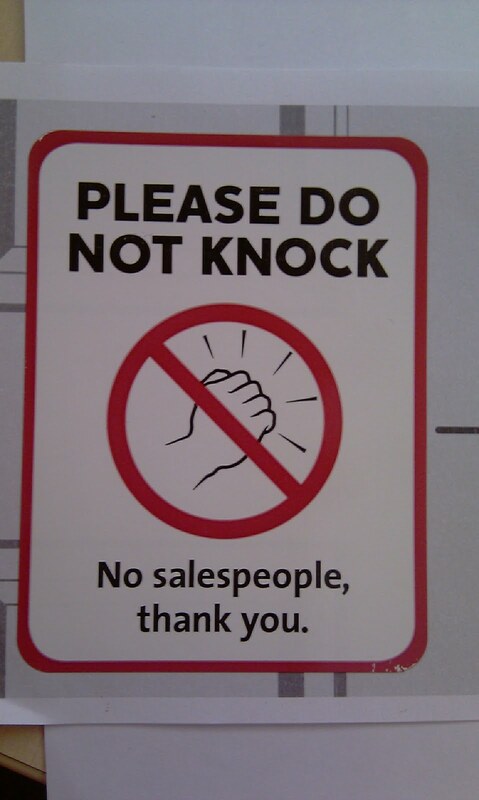 Could it stop everyone from knocking (except, perhaps, for the salespeople, who are so confident about the value of their item that they’ll knock anyway)?